David is a former NASA scientist and field geologist based at the Queensland University of Technology. In his previous role as a Section Scientist at the NASA Jet Propulsion Laboratory in Pasadena, California, he was responsible for the development of lithochemical instruments designed to operate on Mars, the Moon, and other bodies in our solar system. 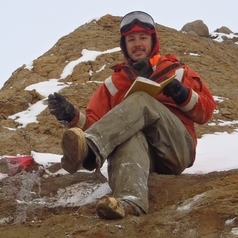 His main research interests are the reconstruction of environments which supported early life on Earth and the search for similar paleoenvironments elsewhere in the solar system. University of New South Wales, Ph.D.
University of New South Wales, M.Phil.